Chairman Dr Sanjeev Kanoria shares how he has grown Advinia Healthcare from a one home operation in north London to become one of the UK’s top 20 largest providers. 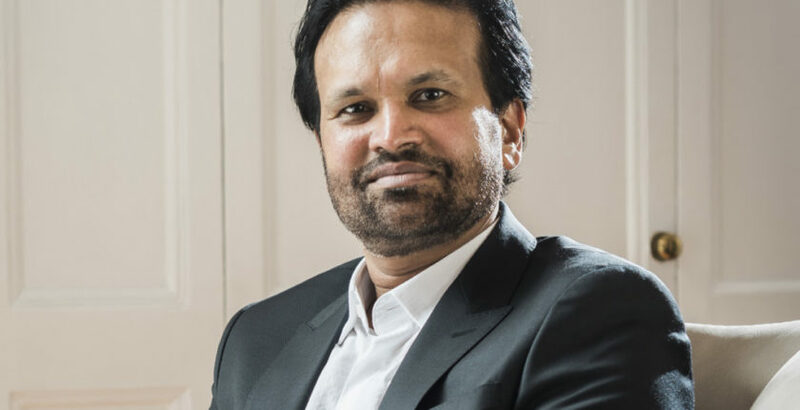 Having practised as a surgeon and completed an MBA programme in the 1990s, as well as working for global management company McKinsey & Company, Sanjeev bought his first care home – Roseacres in Whetstone, North London – in 1999. “I had learnt a lot about healthcare during my time with McKinsey and realised it was not being run very well,” Sanjeev told CHP. Sanjeev set up Advinia with his wife Sangita, funding their first acquisition through equity release from their central London flat and support from NatWest bank. “We were operating from a small shed in the garden at the time,” the Advinia chairman said. “We introduced IT systems to improve performance and quality at our homes. This allowed us to continue our expansion through acquisitions. Having started through small acquisitions and grown to 500 beds, Sanjeev spotted a game changing opportunity to take Advinia to the next level when 12,000 Bupa beds came onto the market. “We joined the process quite late in October 2016,” Sanjeev said. “When I visited some of the Bupa homes I thought we could do something very different with them. I felt we could do a lot better. Having bid for the full portfolio, Advinia eventually lost out to HC-One who agreed a takeover in July 2017. “I think Bupa thought them to be lower risk as they were a larger operator,” Sanjeev reflected. Another opportunity quickly arose, however, when HC-One was not able to provide the full Bupa portfolio due to competition reasons. “Bupa asked us if we would be interested in a smaller portfolio of around 3,000 beds and we agreed,” Sanjeev told us. The portfolio had a wide geographic split covering three clusters of around 1,000 beds in Glasgow, Manchester and Birmingham. “We were not put off by the homes being in different regions as we were already in these parts of the country and knew them well,” Sanjeev said. As well as being varied in terms of geography, the portfolio included homes with quality issues with four of them in embargo. “Many of them were doing ok but we could see that costs were not being very well managed and there was not a good balance between costs and quality,” Sanjeev said. Having taken the homes onboard, Sanjeev set about increasing efficiency and improving performance through the installation of Advinia’s IT systems and technology. “We have simple IT systems,” Sanjeev noted. Sanjeev was faced with the additional daunting challenge of assimilating 3,500 Bupa within the business. “The first thing we did was raise everyone’s salary,” Sanjeev said. Managers and regional managers were inducted into Advinia’s values during a meeting in Manchester. Inevitably, the acquisition of such a large workforce did not always run smoothely, however. “We lost some Bupa managers who found it difficult to match their philosophy with our culture,” Sanjeev explained. Bupa’s recent problems have been well-documented, so how did Sanjeev set out to improve staff retention and reduce agency usage? “If you manage your staff rotas and holidays and sickness well, have a team of bank staff and motivate your staff, you don’t have to have an excessive number of agency,” Sanjeev told CHP. “When we took the Bupa homes over, they had an agency cost of close to £5m. We reduced this by £1m in five months. We have brought staff costs down from 73% to 66% through reducing agency use. With most of the Bupa homes being nursing, Sanjeev was faced with the additional challenge of hiring and retaining quality nurses in a difficult market climate. “We are attracting nurses but it is challenging,” Sanjeev conceded. “We are launching our own recruitment app. We are looking at how technology can help us attract the right group of people. The systems and processes Sanjeev and his team have put in place have already begun to bear fruit with four Bupa homes being taken out of embargo and an across the board improvement in CQC ratings. None of the acquired homes in England are now rated Inadequate, a dramatic improvement on the previous 51% in just over five months. The percentage of Good homes has grown from 20% to 36% in England with those in Scotland up from 72% to 82%. Occupancy too has increased by 3 percentage points to 88%. The acquired homes had a strong bias towards local authority with a private pay intake of around 13%. Sanjeev and his team have managed to increase this level to 15% and have plans to raise this further towards the 40% level at Advinia’s existing homes. “We are confident that we can increase our number of self-funders further as quality improves,” Sanjeev said. The Advinia chair admitted provided quality care in areas where local authorities had not increased fees remained a challenge, however, while noting some improvements in some regions. Having grown sixfold with just one acquisition, CHP was interested to know whether Advinia intended to continue expansion at such a rapid rate. “When you become too big in the service sector you can create problems because you may not have the management bandwidth to manage quality,” Sanjeev observed. “Rapid growth without putting systems in place has been the problem that has beset the industry. We saw that with Southern Cross. You have to realise what the right economies of scale are in this business. Sanjeev said Advinia’s growth programme would continue through small scale acquisitions as well as the construction of its first purpose-built homes. He expects to complete two care homes in the north next year along with another in the south, adding around 200 beds. The Advinia chairman is also aiming to around 400 beds through small acquisitions in the coming months. Technology will continue to act as a key enabler of the company’s growth over the coming years. Advinia has adopted time-in finger printing biometrics to clock attendance to improve efficiency. The provider has also introduced an electronic medicine administration system in most of its care homes. Fibre optics and Wi-Fi have been installed in homes and Sanjeev is hoping to introduce a digital care planning system over the next two years. Most controversially, Advinia was set to launch at robot trial at its Roseacres care home in September with the aim of improving efficiency and care quality through a partnership with the University of Bedfordshire (see Advinia Health Care announces robot care home pilot). “Because of my research background I have always been interested in seeing how you can improve the quality and continuity of care and minimise wastage within our organisation,” the Advinia chairman said. The robots will be programmed with personal data, including care plan information, carer tasks and residents likes and dislikes, and daily habits. They will be given the role of observing residents’ mood and activity and noting completed carer tasks during a shift. They will be able to then pass on information, including missed tasks and medications to the incoming carer to ensure better continuity of care. The six-month trial is being launched in one home to enable Sanjeev asses the benefits and limitations of the programme before deciding whether it should be rolled out across the group. It’s a bold move and one that is sure to be watched closely by the industry.